It would not be until the late-nineteenth century that these harbingers of spring came to Europe and North America. The Industrial Revolution, horticulture as a respected science, a growing middle-class, and gardening as an increasing pastime all stimulated a litany of plant explorers that further connected continents through their flora. 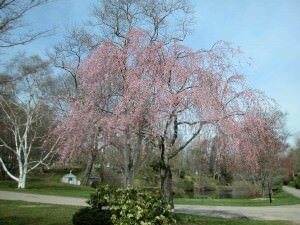 There are a wide range of species and hundreds of cultivated varieties of ornamental cherries (grown for flowers not fruit), and today Mount Auburn displays numerous Prunus species throughout our landscape. Cherry flowers are divided into four groups based upon the number of petals. Single-flowered have five petals (though often with one or two extra). Semi-double-flowered have ten to twenty petals. Double flowered have twenty-five to fifty petals and finally there are cherries with more than one hundred petals called chrysanthemum-flowered. We call your attention to several worth your visit this and every spring. Prunus sargentii, Sargent cherry is one of the best ornamental cherries for our area. In late April the entire tree is covered with soft pink, five-petalled flowers which have a pleasing delicate fragrance. These flowers may last more than one week and if successfully fertilized produce a purple-black fruit that is often taken by birds before they ripen. The tree grows 20 to 30′ high and the bark has a somewhat polished chestnut-brown color. In autumn the leaves turn shades of red, orange, and rosy pink, all on the same tree. This tree is wonderfully adaptable to varied cultural conditions and will do well in most home landscapes. This was introduced into the United States in 1892 by Charles Sprague Sargent (1841-1927), founding director of the Arnold Arboretum. 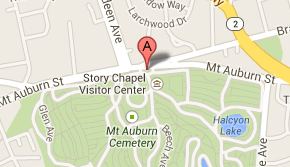 Visit the Sargent cherry on Mist Path (#44 on Mount Auburn’s Big Trees map) the next time you visit the Cemetery. Prunus subhirtella ‘Pendula’, weeping higan cherry has a pleasing pendulous habit to its branches. 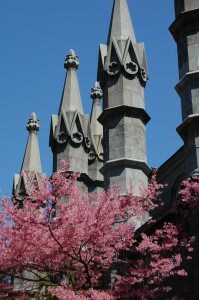 These weeping branches have pink spring buds which open to single, light pink (sometimes white) flowers. On some individuals there may be a colorful autumn foliage display but all of these fast-growing, weeping trees offer a graceful silhouette in the winter landscape. As one of the first Japanese ornamental cherries to come to the United States, it was listed in an 1846 Rochester, N.Y., nursery catalog. 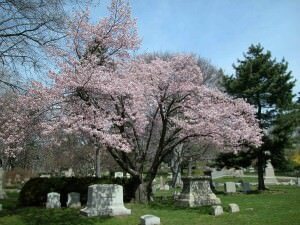 There is a fine specimen of Weeping Higan cherry on Sibyl Path near Birch Avenue (#88 on Mount Auburn’s Unusual Trees map) at the Cemetery. Prunus x yedoensis, yoshino cherry is the national flower of Japan and is widely planted throughout that country and now in many other parts of the world. This is a tree of hybrid origin which still challenges researchers on details of its nursery origin but nonetheless displays beautiful single, pink or white slightly fragrant flowers before the leaves emerge in late April. It was introduced into western horticulture in 1902. 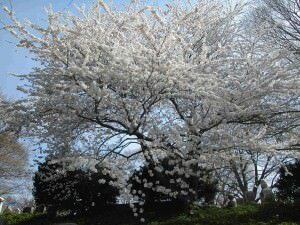 The Yoshino cherry pictured above may be found on Walnut Avenue at Mount Auburn. Prunus serrulata ‘Kwanzan’ is without doubt the most popular cherry outside of Japan. ‘Kwanzan’ is a cold hardy, double-flowered form with pink flowers 2 ½” in diameter with about 30 petals which tends to bloom a bit later than the other three species already mentioned. These vase shaped trees may reach 30′ high with an equal spread. The ‘Kwanzan’ and the aforementioned Prunus x yedoensis comprise much of the famous planting surrounding Washington D. C.’s tidal basin. Later this month come visit our cherry blossoms and join the multitudes that over time have been inspired, enthralled, or simply pleased by viewing these wonderous botanical gifts from Japan. *This Horticulture Highlight was originally published in the April 2011 issue of the Friends of Mount Auburn electronic newsletter.